Product Description: less text Mom, (noun): 1) someone who sees the best in her kids, even when they drive her crazy. 2) Unconditional love. See also: saint, taxi driver, angel. Your mom is one of the most precious people in your life so this Mother's Day why not spoil her in the best possible way ever, with this gorgeous gift from the NetFlorist Flour & Flower range! This gift is made up of 6, moreish and delectable Black Forrest Cupcakes with edible cake toppers. What makes this gift extra special for your mom is that it is paired with pink roses, aspedistra, million star flowers in a gorgeous purple vase, that is tied off with a vibrant pink ribbon to make it extra pretty! 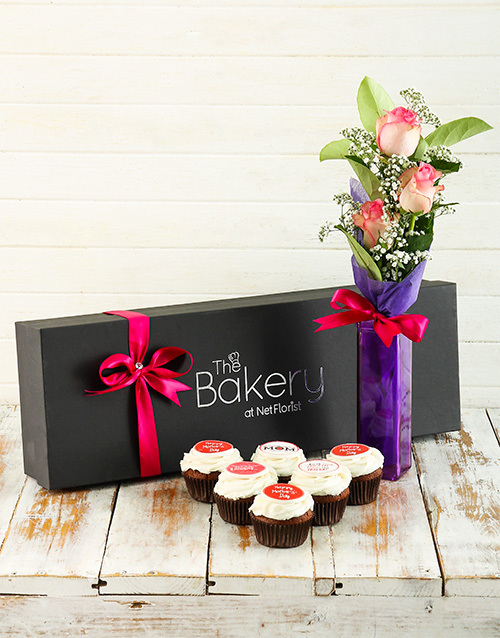 The flowers and cupcakes sit together in purple tissue paper in a stylish black box wrapped in a bright pink ribbon. Send today with NetFlorist! All our products are Halaal Get this Flour And Flower Gift Box For Mom delivered with NetFlorist.